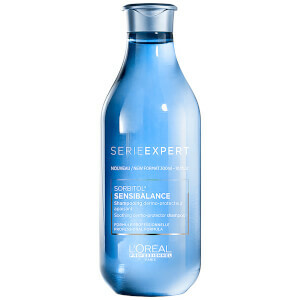 Comfort sensitive scalps with L'Oréal Professionnel Serie Expert Sensi Balance Shampoo, a gentle cleansing formula dedicated to relieving and refreshing dry, itchy scalps. Performing a gentle cleanse, the shampoo effectively lifts away dirt and impurities whilst protecting and hydrating to promote a healthy scalp environment. Soothing and refreshing, the shampoo contains Sorbitol and leaves even the most dry, sensitive scalps feeling calm, clean and balanced. Suitable for sensitive hair and scalp.